We normally take engagement portraits with our Sweethearts in that magic golden hour right before the sun goes down. But sometimes sunset isn’t possible schedule-wise, so we set alarms and head out to locations and wait for the sun to join us. Marley and Remington live in Tennessee, but chose to have their wedding in Texas near Remington’s parents since that was the most central location for all their family throughout the US. So when Marley and her mother made a trip to Texas one weekend to get all their vendors booked, they squeezed us in for a quick coffee meet up between cake tastings and a trip to the Magnolia Silos. We loved Marley, her mom, and Remington’s mom right away, and loved how Marley talked about her relationship with Remington. So we were so excited to get to work with them in 2019! 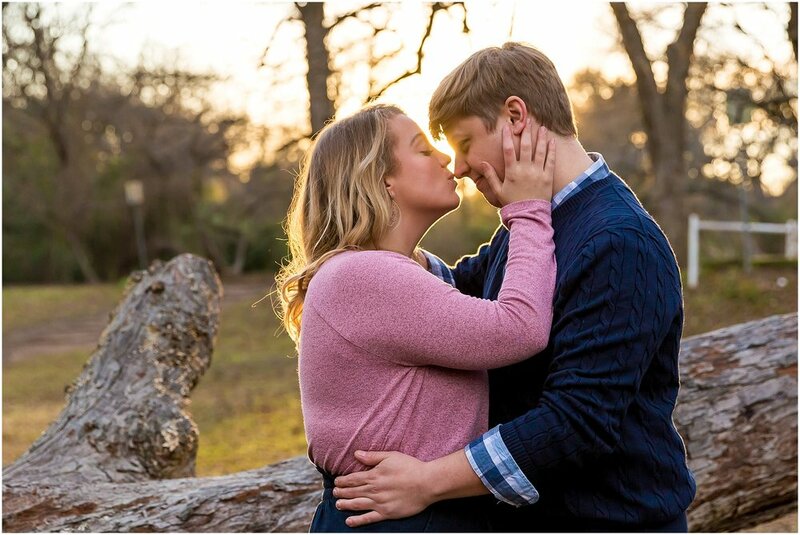 Since they live in Tennessee, we only had one shot for an engagement session with them when they were in Texas visiting Remington’s family for Christmas. And with work schedules and family Christmas celebrations, the only opportunity we had to connect with them for their session was Saturday morning before Christmas. So Remington and Marley drove down from DFW to make it to Waco by sunrise. Talk about dedicated! It couldn’t have been easy to leave DFW in the 5 am hour, but we are forever grateful to them because sunrise sunlight just might become our favorite light! 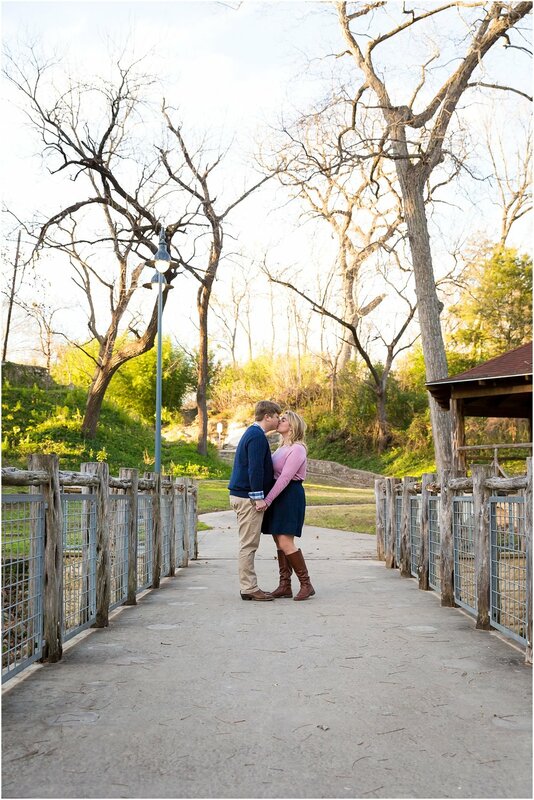 The way the warm sun filled the space at Cameron Park highlighted these Sweethearts and their love. Remington & Marley were naturals at posing, switching from sweet romantic moments to laughter and dancing with ease. And they seemed wide awake and warm the whole time, which is not easy to do on an early morning in December! When we asked Remington to whisper in Marley’s ear, Marley busted out laughing at whatever he had said. 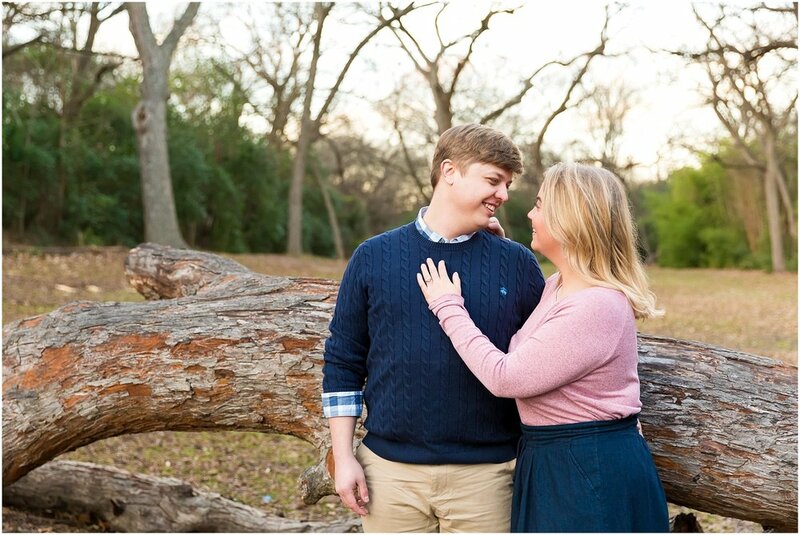 The “whisper test” is always a great moment at an engagement session, because we learn the true nature of our Sweethearts and their relationship based off whether they whisper sweet words, funny jokes, or random nonsense words. And we knew Remington & Marley were a fun couple who brought out the joy in each other when Marley immediately started laughing. 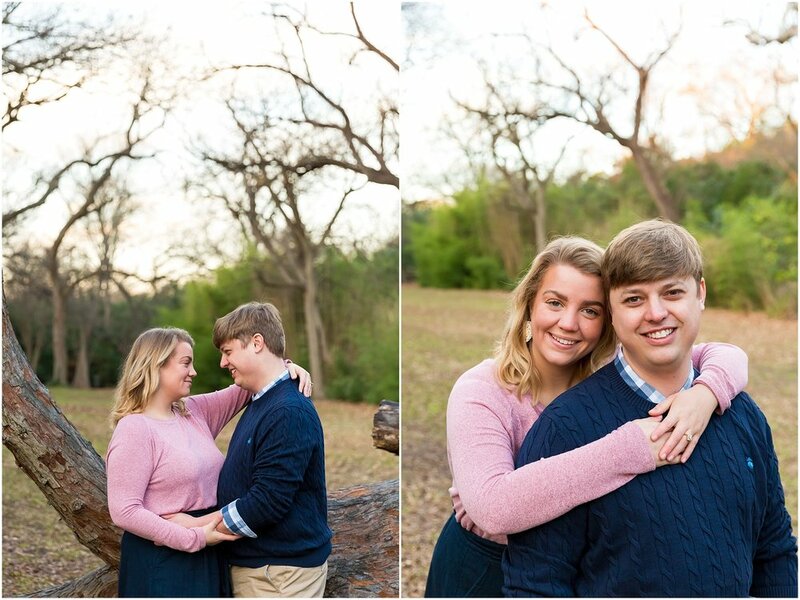 Their session was so beautiful and so fun, and we can’t wait to be with them again in June! Thank you, thank you, thank you for meeting us bright and early in Waco! We loved seeing you in person again, Marley, and meeting you, Remington. You two were flawless, and your love for one another shows so much through these images. We hope you enjoy the remaining days of wedding planning and being engaged. And we can’t wait to see what married life has in store for y’all!